People often assume that tofu is bland and tasteless. This recipe for sesame seared tofu says otherwise. 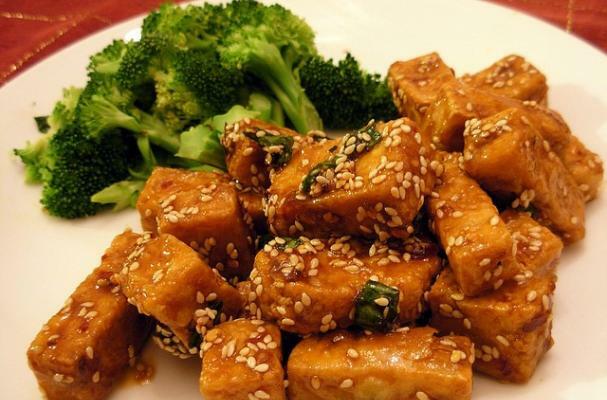 Firm tofu is covered in sesame seeds and cooked until golden brown. The flavor of the seeds intensify and become nutty. Served with a tasty miso dressing made with soy sauce, mirin and rice wine vinegar. Blend all dressing ingredients until smooth. Best if allowed to chill overnight. Heavily coat one side of tofu with jalapeno miso dressing. Allow to rest in fridge for 2 hours. Once tofu is done marinating, heat a dry pan over medium heat. While pan heats, spread a layer of sesame seeds and a pinch of salt on a plate and press non-marinated side of tofu into sesame seeds. Hold hand just over bottom of pan to feel how hot it is. (You should feel heat emanating towards your hand.). When it’s ready, add both oils, swirl in the pan and lay in then the tofu (sesame side first). Cook on both sides until golden brown, approximately 2-3 minutes on each side. Serve over a bed of greens and drizzle with extra dressing. Salt to taste.